to do this for him – and they have 5 days to finish the job. As a reward, Zeus has decided that the god who performs the best while making this universe will take his or her place among the greater gods and be admitted into Mount Olympus. 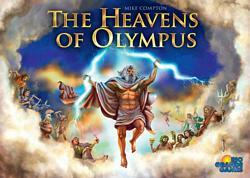 Each player takes on the role of one of these unknown gods working to help create the Heavens of Olympus. The goal of the game is to earn the most Prestige Points. Prestige Points can be earned at the end of each round and during each round if specific actions are completed. 1 Game Board, 5 sets of Planet Markers - one set per colour (10 Markers per set), 10 Circular Markers - two per colour, 5 "Allotment" Boards, 1 Circular grey "Time" Marker1 "Sun" Token, 1 "Moon" Token with plastic foot, 5 sets of "Plan" Cards (4 cards per set), 30 "Power" Tokens marked "1", and 20 "Power" Tokens marked "5"